Board can be used with magnets (not included); mounting the board is optional. 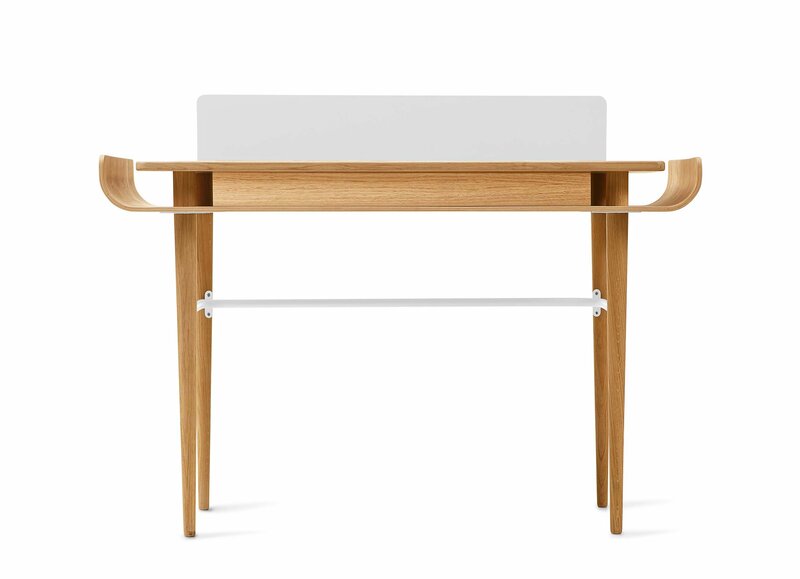 Please welcome GAPA – the very first desk in our catalogue. The first thing you'll notice is its unique shape – streamlined, sleek and symmetric. Instead of making it large, we focused on other features that can improve your organisation. At the back of the desk, we added a magnetic board made of powder coated steel, ready to look after your favourite pictures, daily notes, inspirations, and memories. To protect your workspace from piles of paper, beneath the solid oak desktop we placed a convenient plywood shelf. Look how smoothly we have bent its edges upwards – it's our latest trick! Notice the gap they form around the table. Not only it looks distinctively, but it can also protect you from invasions of cables and wires. Actually, we liked it so much that we named the piece GAPA. GAPA is a stylish and original desk, inspired by design of the 60s & 70s. It keeps everything that matters within your reach, so you won't waste your time for any unnecessary movement. Its compact size makes it perfect for home cabinets and smaller offices, but give it a little more space and GAPA will charm everyone with its symmetrical, round grace and cosy finishing.